Will new infrastructure come on line quickly enough to accommodate continued production growth? This article ran in a special section of the Wall Street Journal published on March 12, 2019. Ten years have passed since U.S. crude oil production reversed its decades-long decline and staged the most remarkable comeback in the industry’s history. The numbers continue to astound. In 2018, output grew by nearly 2 million barrels per day (mbd), vaulting total U.S. production to almost 11.9 mbd in January of this year — enough for first place in the league of the world’s super-producers, ahead of Saudi Arabia and Russia. But with growth spurts come growth challenges. The U.S. oil industry is rapidly outgrowing the pipelines, export terminals, and ships needed to move its oil to new markets. In response, a new wave of infrastructure investment is underway. But will the new infrastructure come on line quickly enough to accommodate continued production growth? The pace of building is most apparent in the Permian Basin and along the Gulf Coast. The Permian is the center of U.S. tight oil growth. The challenge is location. At nearly 4 mbd (and growing), combined production in West Texas and New Mexico is now greater than the output of all but a handful of the biggest producing countries in the world. The few and scattered refineries in the basin can only absorb a fraction of this flood; the rest must move to bigger markets. Increasingly, these barrels go outside the U.S. Many of the refineries along the Texas and Louisiana Gulf Coast were designed to run heavy crude, typically from Latin America, Canada, and the Middle East. These facilities have maxed out on the amount of very light crude from the Permian they can process. Fortunately for U.S. producers, there is a growing need for crude abroad, especially in Asia. Since the federal government ended the ban on crude oil exports in late 2015, the U.S. now regularly sends 2.5 mbd overseas, making it one of the world’s top crude exporters practically overnight. But getting more barrels to international markets has not been easy. Since 2013, the Permian has had over 2 mbd of pipeline capacity added. But this was not enough; production still outpaced pipeline capacity, forcing oil to move by rail and even long-haul trucks, which are more expensive. Producers lacking access to pipelines were forced to offer heavy discounts: last year, oil priced in Midland, Texas was as much as $20 per barrel below the same barrel priced in Houston. Adding pipeline capacity is only part of the story. Producers drilling for oil in the Permian are also generating huge volumes of natural gas as a byproduct, and it, too, must find a home. The industry has found creative ways to boost existing capacity, such as use of drag-reducing agents that make the flow of molecules more efficient and conversion of underutilized noncrude pipelines. And growth in Permian crude oil takeaway will step up dramatically by the end of 2019, when three large-diameter pipelines are expected to be completed, with a cumulative 2.3 mbd of new capacity. New gas pipelines are also under construction. Additional new capacity will follow after 2020. The new pipelines connecting the Permian to the Gulf are likely to fix the existing bottleneck. But new forms of congestion could emerge along the coast as ever greater volumes of oil look to move to the growing but still-distant markets of Asia. Crude oil is currently exported out of all the major ports of the Gulf Coast (see map). Many terminals in these ports are expanding capacity by adding docks, reconfiguring to accommodate bigger tankers, and upgrading loading pumps. Some of the bigger terminals are already quite busy. Not only is there rising demand to move crude to the water, there is also a rising export business for refined oil products. Finally, there is a baseload volume of crude still being imported from Latin America and the Middle East, since that oil is well suited to much of the Gulf region’s refining kit. 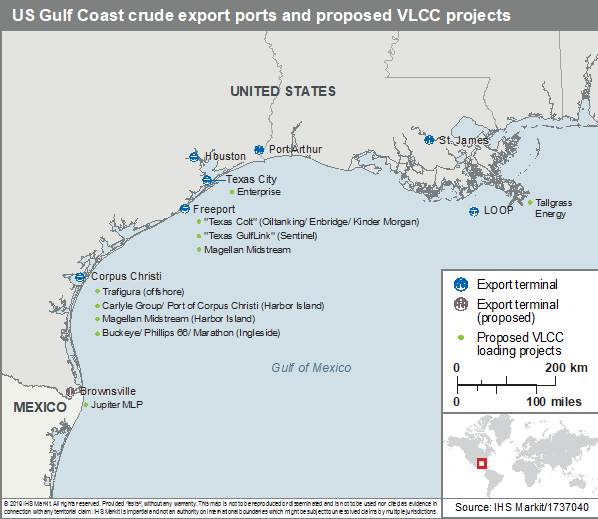 Yet with the exception of the Louisiana Offshore Oil Port (LOOP) facility, which has historically serviced crude imports, U.S. Gulf Coast ports cannot accommodate fully loaded VLCCs. Instead, VLCCs in the Gulf must first be loaded by several smaller ships, which make costly and time-consuming trips to staging zones, where they transfer the oil to the bigger ships. This has led to several proposals to dredge port channels and build new VLCC single-point mooring systems, which would provide a direct link from shale basins to waiting vessels offshore. This would leapfrog the increasingly congested ports along the Gulf and lower the per barrel cost of oil exports. One or more of these facilities is likely to be built by early next decade. Once the new Permian pipelines open for service later this year, the growth in flows to export terminals will likely accelerate. Permian producers can be expected to take advantage of this by tapping the “DUCs” — the large inventory of wells that have been “drilled but uncompleted.” As fast as supply has grown, a new tidal wave may be on the way. A key uncertainty is whether and when shipping terminals will be able to accommodate a potential sharp rise in inbound flows. Another question is how easily international refiners can digest the very light crude on offer from the U.S., especially since some of the new refineries in Asia are designed to run heavier Middle Eastern grades. Renewed discounting of U.S. oil may be necessary to keep adding new offshore customers. There is opportunity for new infrastructure investments, but also risk. Could there be an overbuild? Might certain assets be left underutilized? The answers to these questions will play a big part in determining whether U.S. oil production continues the strong growth it has exhibited over the past decade. Aaron Brady is Executive Director of Oil Market Services at IHS Markit.